Edward Smith-Stanley (1752-1834) succeeded his grandfather as 12th Earl of Derby in 1776. Prior to this he had served as MP (Whig) for Lancashire in 1774-76. Derby’s succession brought him the family estate of Knowsley, Lancashire, and in the same year he inherited a lease on The Oaks, Surrey from his aunt, Lady Charlotte Burgoyne. As an Earl of Derby he maintained his ancestor’s tradition of becoming Lord Lieutenant of Lancashire in 1776, a position he held until his death in 1834, and he also served as Chancellor of the Duchy of Lancaster in 1783 and 1806. Derby is best remembered as a supporter of horse racing, but also for his troubled marriage. In 1774 he married Lady Elizabeth Hamilton (1753-97), daughter of the 6th Duke of Hamilton and the famous beauty, Elizabeth Gunning. After five years, the Countess had an affair with a notorious rake, John Frederick Sackville, 3rd Duke of Dorset. The couple separated, but the Earl refused his wife a divorce – preventing her from marrying the Duke – and refused her access to their three children. One week after the Countess’s death in 1797, Derby married again, his companion, Miss Elizabeth Farren (c1759-1829) an actress, by whom he had another three children. 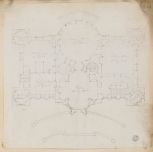 There are no surviving drawings for the temporary pavilion within the Adam drawings collection at Sir John Soane’s Museum, but in the third volume of the Works in architecture of Robert and James Adam (1822) there is a plan of the pavilions as executed, showing a D-shaped building containing a central ball room, and a long supper room curving around the ballroom, and with a small tea room at each end. In the Works there are also two engraved views showing the supper room and the ball room. Both of these views were engraved from watercolour drawings commissioned by Derby, and by the Adam office draughtsman, Joseph Bonomi, and that for the supper room was sold at Bloomsbury Book Auctions on 1 June 2000. The pavilion at The Oaks contained Adam’s two largest executed rooms, but it was a temporary structure, and presumably constructed from wood and canvas. On inheriting in 1776, Derby commissioned Adam to make designs for work on Knowsley, and then in c1777 to make designs for The Oaks: his intention was to improve his aunt’s house. The Oaks estate – taking its name from a local grove of trees – contained an older house which was reworked in the middle of the eighteenth century, possibly for a banker named Sir Thomas Gosling, and possibly to designs by Sir Robert Taylor (1714-88). The lease was acquired by Burgoyne in the mid-1750s and he made further alterations and improvements, also to designs by Taylor. Adam made six known unexecuted alternative designs for The Oaks, although some guess work has been necessary to sequence these in chronological order as the drawings which appear to comprise the second and fourth schemes are little known. With each design the complexity of the structure and its ornamentation appears to decrease, thus decreasing in cost: it is noted in pencil on one drawing in the first scheme (Adam volume 29/28) that the cost to build the design would be £11,000; a drawing from the third scheme (Adam volume 29/31) includes the cost of £8,903.12s. ; a drawing from the fifth scheme (Adam volume 29/34) includes the cost £5,589.14s; and a drawing from the sixth scheme includes the cost £5,404.5s. What does seem clear is that four of these six schemes were sent for Derby's consideration as those schemes with annotated prices were produced as finished drawings, and irrespective of their appearance within the apparent design evolution, they are labelled in the pencil inscriptions giving cost as designs A, B, C and D. None of the six designs were realised, but according to Rowan this work had an enormous impact on Adam’s development as a designer of castle-style houses – he was just beginning his work at Culzean Castle Ayrshire. The work to remodel the house was begun in 1777, and a single pencil sketch for this work in Adam’s own hand survives (Adam volume 10/25). The project was abandoned and left unfinished only a year later in 1778. Derby lost all interest in his building projects at both Knowsley and The Oaks following the Countess’s affair with the Duke of Dorset, and his subsequent efforts were focused on sporting activities – principally horse racing – he was responsible for instituting the Epsom Oaks, and the Derby Stakes. Knowsley remains in the possession of the 19th Earl of Derby. The estate contains a safari park founded by the 13th Earl, and part of the house is leased for events. The Oaks was sold by the 12th Earl shortly before his death in 1834. It passed through several hands, suffered a fire, and was partly rebuilt in the mid-nineteenth century. In 1915 it was sold to the Surrey Joint Poor Law Committee for use as a home for women with epilepsy, and then in 1933 it was sold again to the Carshalton Urban District Council, who opened the park to the public. The house was used during the Second World War by the Home Guard, the RAF, and the army. By the 1950s the house was in a state of dilapidation, and the council could not afford to make the necessary repairs, so it was demolished in 1957-60. See also: 10 Hertford Street, London; Derby House, 23 Grosvenor Square, London; Knowsley Park, Lancashire.